It is Day 28 of the 30 Day Painting Challenge! Another one sort of finished but not really! I think a pale blue filmy veil hanging off the top section of this crazy hat (in back) might be nice… or might not! Maybe some wallpaper. I just could not decide what to put in the picture frame so I left it. Perhaps it’s an interior window to a pink kitten room. Or the place they keep the cotton candy machine. Thanks so much to everyone from the 30-Day challenge who has visited and left a note, and everyone else, too. Stay warm out there, particularly if you’re experiencing this rough winter! 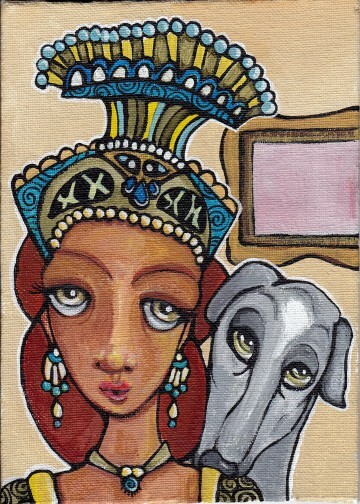 This entry was posted in Acrylics, Elaborate Costume, Progression Photos and tagged art dog, maidens on January 28, 2014 by The Beast Tender. Really enjohy your work Cindy….. very creative…. and congratulations on the Acrylics…very nice touch. And, oh, not so chilly our there in Arizona. Love the eyes. Everything works together to create a cohesive style. yes, the cotton candy factory. and she looks like her hat is making her TIRED and that dog is being a bit rude with his nose! Love all your progress shots, Cindy! :) This is a highly creative piece. Haha! Not a bad idea. I wonder if I’ll go back to any of these after the end of the challenge. Love the matching eyes! I have enjoyed looking at all of your creative critters and lovely ladies. Great job, Cindy! The princess/queen and her beast. I love how their eyes are so similar and the expression on their faces! Great work.